Arthur Allen Taylor as lord mayor in the Council Chamber, 9 December 1908 City of Sydney . 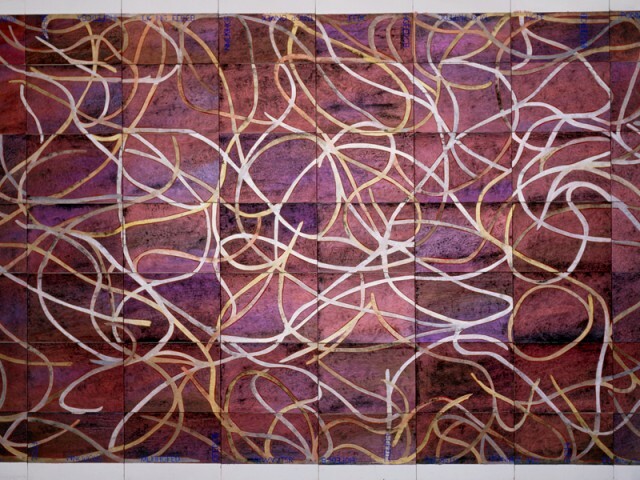 Designed by Australian artist, Imants Tillers, the rug in the Council Chamber was inspired by the interconnectivity of contemporary and pre-colonial traditions. Photo Bart Maiorana. Attributed to architect John Hennessey, 1881 Building and Engineering Journal, 15 September 1888, p205 Mitchell Library, State Library of NSW. Used almost continuously since 1884, the Council Chamber is the seat of the City of Sydney's local government. Photo Bart Maiorana. Built by William Coleman and Sons in 1883, the Council Chamber furniture is a rare example of Australian Aesthetic Movement style furniture. Photo Greg Piper. 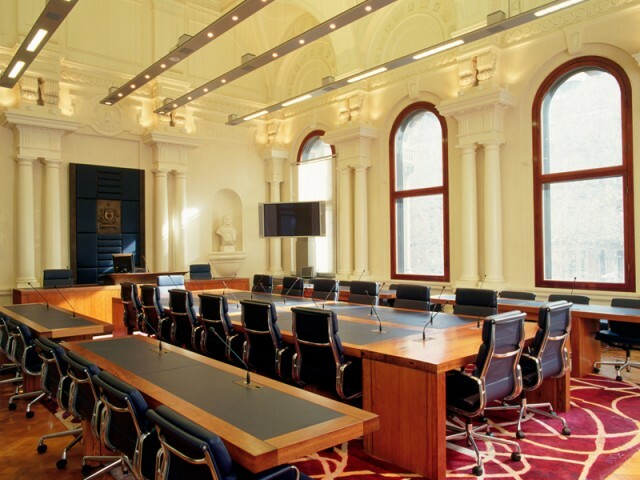 In 2003 the Council Chamber was refurbished to accommodate stat-of-the-art meeting and multimedia facilities for council meetings. Photos Peter Murphy. 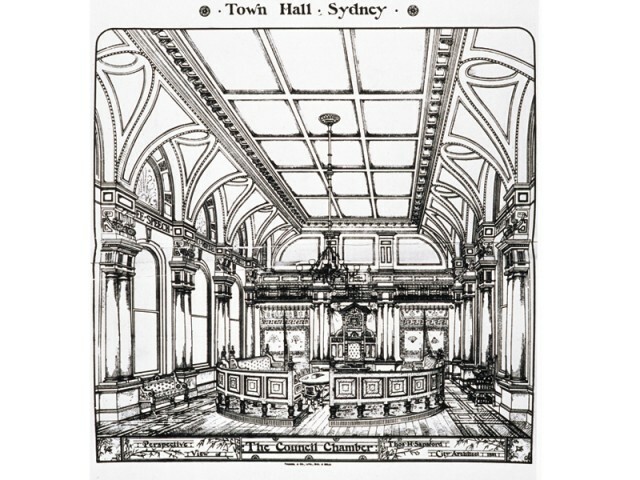 Sydney Town Hall is the official ‘home’ of the Council of the City of Sydney, the local government authority responsible for administering the affairs of the city of Sydney. Since 1884, the Council has met in the historic Council Chamber. 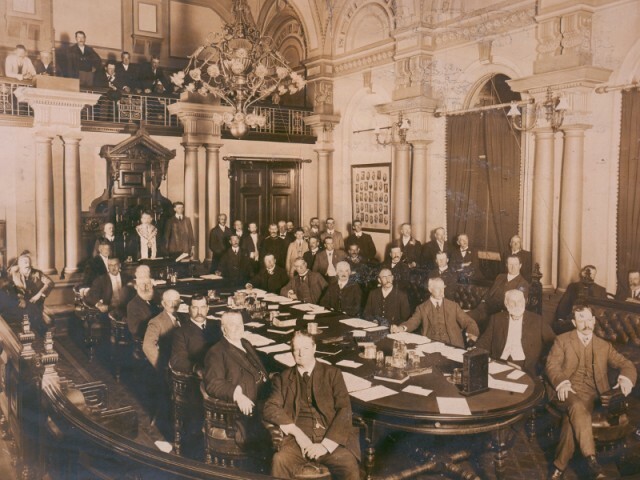 The Council of the City of Sydney was created in 1842, fifty-four years after the first Europeans arrived in Sydney and fourteen years before responsible government allowed the people of NSW to elect their own Parliament. The establishment of a council to administer the affairs of the town was an attempt to impose a sense of order on the chaos which had ensued from a penal settlement under English rule. The Council (then known as a Corporation) administered law and order, managed utilities including water, sewerage, roads and lighting and regulated trading practices and public health. This municipal government was administered by aldermen and councillors who elected one of their own as mayor, a tradition which continues to this day. The first council had met in the old city markets (now the site of the Queen Victoria Building), then in rented premises in public houses until the Town Hall was completed. It wasn’t until 1884 that a dedicated meeting room and debating chamber inside the Town Hall was completed and available specifically for meetings of Council. These meetings were open to the public, who could view proceedings from a public gallery, thus keeping the process of municipal government open and transparent. Assistant city architect John Hennessey designed a chamber and a suite of appropriate furniture using the Aesthetic Movement influences he had learnt during his studies in England. 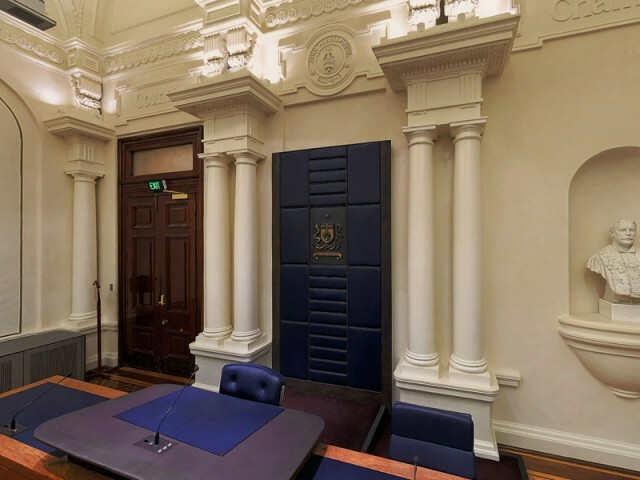 The room retains Hennessey’s design and features a tiered public gallery on the eastern wall, alternating paired Doric columns and entablatures between the arch-headed windows, and the striking contrast between subdued painted plaster and the rich patina of Australian red cedar joinery. 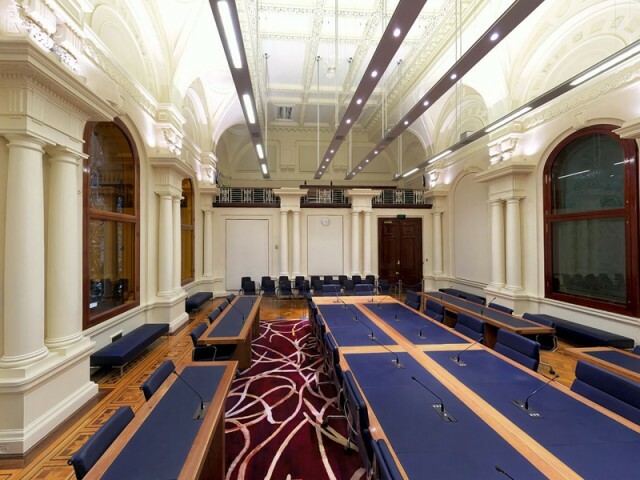 In 2003, the original furniture was removed from the chamber and new furniture, capable of meeting the multi-media requirements of modern council meetings manufactured. Recycled ironbark timber was used to create new furniture and a large floor rug with references to contemporary Australian Aboriginal art was designed by artist Imants Tillers. A redesigned coat of arms, which simplifies the original heraldic imagery and is more respectful to Sydney’s traditional landowners, was also installed as part of these works. 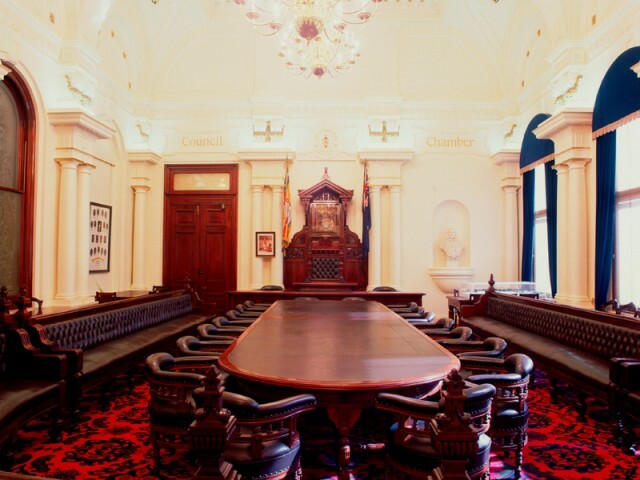 The original suite of cedar furniture, designed by John Hennessey and built by William Coleman and Sons specifically for the Council Chamber is highly valued for its heritage significance and its associations with the Council Chamber and the Town Hall. has been relocated to the Lower Town Hall to create a unique meeting space. Australia is administered by three tiers of elected government at local, state and federal levels. The City of Sydney is the oldest of the 152 local councils in New South Wales and administers an area of 27 square kilometres and a population of almost 170,000 people. The powers and responsibilities vested in Council derive from the framework set out by the NSW State Government in the Local Government Act 1993. The Council of the City of Sydney consists of democratically elected councillors who serve a popularly elected lord mayor. The current Council comprises the Lord Mayor of Sydney, Clover Moore and seven councillors. The elected council determine the strategic direction and policies for their municipality and appoint a chief executive officer who in turn appoints staff to implement council policies and administer and manage services. Members of the public are welcome to attend Council meetings which are held in the Council Chamber in Sydney Town Hall on every third Monday at 5.00pm. Visit the Council’s meeting calendar for more information. 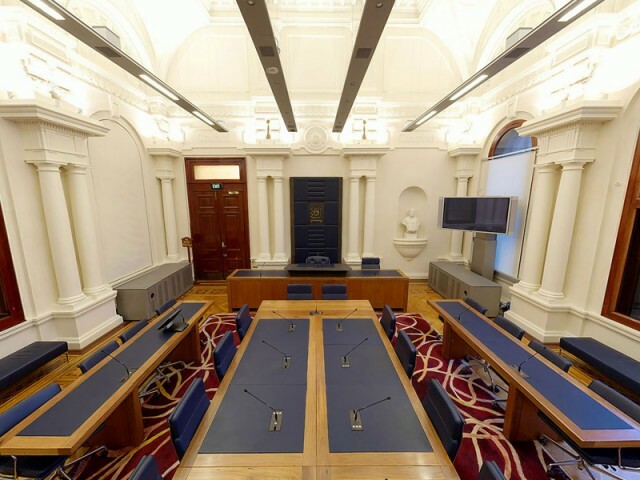 Guided tours of the Town Hall, which include a visit to the Council Chamber are available by appointment.